Back in the day (™ Aaron – all rights reserved) I used to love a Point and Click adventure game, below I have compiled a list of what I think are the essential Amiga Point and Click games. Do you agree? , any honourable mentions you think I should add? Have I lost my mind ? It looks like you’ve lassoed the cream of the crop there. I also had a lot of fun with Hook as a kid. Although it’s hardly up there with Monkey Island, I like the cartoony art style and the enchanting Neverland setting. It’s easy to be absorbed by the atmosphere if you’re into the movie it was based on. Ocean did a really good job of capturing the mood and characters, I felt. I’ve got reviews of STS2 and Flight of the Amazon Queen in the can and ready to post as it happens. I also started writing about Willy Beamish and Innocent Until Caught… until I realised I don’t care about either of them. Bleh, bland personality wastelands the pair of ’em. I don’t know them ones, don’t feel I missed anything ! Nope, not much. 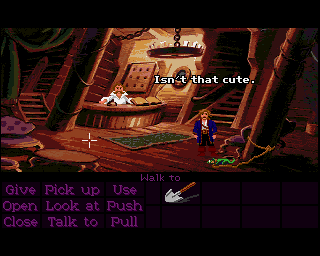 Some lame attempts to match Monkey Island’s humour, cobbled together with weak plots. What attracted you to Inherit the Earth? Even though it’s a polished, highly regarded game I struggled to connect with it. It takes itself quite seriously, yet it all revolves around talking animals, which should be more amusing than it seems to be. Inherit the earth was a game recommended to me, so I gave it a go with my usual ‘1hr window’ and just got into it – nothing more than that !